American Baptist – what is one? Welcome to First Baptist Church! We are excited to have you at our Bloomington area church and to get to know who you are as a person. We hope this page will let you know more about our identity as a church, and give you an idea of what you can expect from services at FBC. At First Baptist Church, we seek Christ in all things and as such, we try to love and serve others in the Bloomington area like Christ—whether through volunteering in the community, promoting social justice issues, or even making blankets and shawls for those in need. Our aim as a Bloomington area church is to help others better understand the love and character of Jesus through our actions. If you haven’t grown up going to church, or even if you’re simply new to Bloomington, you probably have questions about what we do and how we do it. We want to address these questions so you feel more comfortable about visiting and/or getting involved. Worship Service – At First Baptist Church, we offer a two worship services. The first service is at 9:30 a.m. and the second at 11:00 a.m. on Sunday mornings, with each being about an hour long. During each service many generations sing, read scripture, pray, and listen to a message from our pastor. 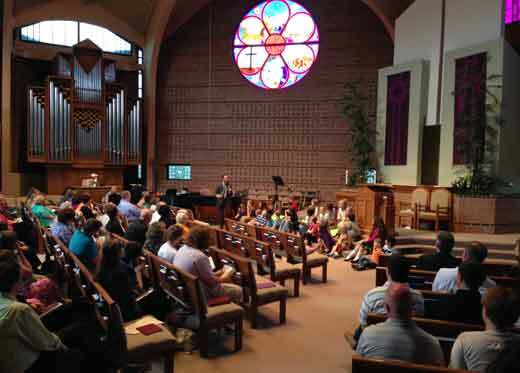 Music – As a moderate to progressive Baptist church, our worship service blends old and new. 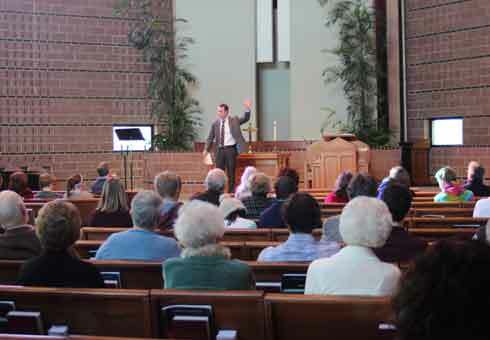 For example, you are likely to hear an old hymn and a contemporary worship song in the same service. If you don’t know how a song goes or if you aren’t comfortable singing, we provide the words and encourage you to think—and even ask—about their meaning. Dress – At First Baptist Church, we do not want you feeling nervous about what to wear. We have a diverse and vibrant congregation, so wear whatever makes you comfortable—whether it’s gym shoes or dress shoes. Kids – Childcare is available for those with small children. However, as an intergenerational church, we love having children in the worship service! We invite first graders and up to join in the worship at 11:00 am. For children in kindergarten or who are younger, we offer Worship Care. Infant – Toddler – Worship Care beginning at 10:45 am. Ages 3 – Kindergarten – Join for the first part of worship until they are dismissed for Worship Care. Church School for all ages is at 9:30 a.m., with the exception of Sr. high who attend worship service at 9:30 a.m. and meets for Church School at 11 a.m. There are various age groups – children, adult, and senior adult – that meet to discuss Scripture and share their lives. Parking – Disability and guest parking are available on the south side of FBC’s parking lot. A greeter is stationed at the front door for those who need additional assistance. Questions for the pastor? Want to get to know people in the church? Grab a cup of coffee at The Gathering from 10:30 a.m. and 11:00 a.m.
Want to learn more about the beliefs of the American Baptist Church or about how to get involved in our Bloomington area church? Come to Exploring God at FBC. Since you’re on this website, Connect with us via FBC’s Church Newsletter to see upcoming events or service opportunities. Interested in studying the Bible with others? Join a Small Group! What does it mean to become a member at First Baptist Church? Click Here to find out. If you have any other questions, Contact Us Online or call 309-662-4253. We would love to help you connect with our Bloomington area church in a meaningful way! Church School - 9:30 a.m. to 10:30 a.m.
Fellowship - 10:30 a.m. to 11:00 a.m.
Worship - 9:30 and 11:00 a.m.
American Baptist Churches of the Great Rivers Region.